As I write this review, it is late March and we are having a run of bright sunny days where it really feels like spring. The bees are out, as are the fair weather bikers and more sports cars than the normal winter's day. In fact, perfect conditions to be driving a car such as the Smart Cabriolet. 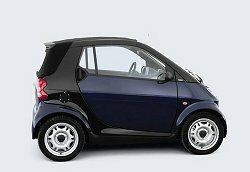 Unfortunately, I actually drove the Smart in January. I recall it happened to be the coldest week of the year. Oh, and we had gale force winds too. Lovely. The test could not have been further from the intended use for the Cabrio. Not only was it laughable to take the roof down (which of course we did in the name of research for you lot), but also my driving for the week was to consist mainly of motorway and fast A-road routes. If it had been completely terrible, it would be unfair to bring all this up as Smart never intended the Cabrio to be used in this way. It is testament to the car though that I still liked driving it by the end of the week. Though admittedly I was sick of wrestling with it on the motorway - no driver could fall asleep while being blown around the road in the Cabrio! In complete contrast to the exterior colour scheme, the test car had a very sophisticated interior, complete with tasty leather (heated) seats and steering wheel. The colour scheme was greys, faded blues and blacks, which appeal to me much more than the lairy orange seats in the Smart Passion we drove previously. 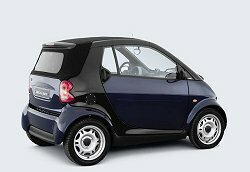 For two people, the Smart is a comfortable and spacious place to be. The specification includes air conditioning, those heated seats (very useful in January), a CD player etc. There are serious downsides too though. The boot, though larger than I expected, is not large enough to carry suitcases, so travel bags must be chosen to suit the space. However, carrying large items is completely out of the question. The stereo itself works well in town, but is easily drowned out by wind noise at speed. It should be noted that the interior does not exude luxury. It is quite plasticky, though it is well put together. I was not quite mad enough to drive the car with the top removed, though of course I did play with it. For a start, I love the fact that pressing a button on the key fob can retract the roof. It's a pity that it cannot be closed in the same way too. Once the main portion of the roof has been lowered into the boot, the roof bars may be removed and stored within the boot lid itself - a neat touch. Then, with the windows down you feel like you are in a real cabriolet, even though the car feels like a coupe with the roof in place, if not quite as snug as the new generation of coupe-cabriolets hitting the market. It is all very well made and engineered though. The same feeling comes from the rest of the car. The driving experience may be quite different to your average car, but it all works. The steering is light and responsive and the brakes work particularly well. The instruments are clear, and feature some unique and clear graphics. I really like the extra gauges that look a little like Halfords turbo boost gauges, which are perfectly circular - a theme carried throughout, extending to the oversized key. As mentioned by Adam while driving the coupe, the biggest let down is the gear change. The engine may not be very powerful, but the transmission itself ruins the package. It just needs to be a lot quicker, or have a sport mode. Hopefully something different will be done in the forthcoming Roadster. The handling is amusing. 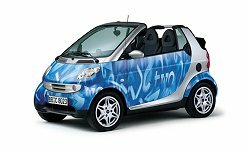 Around town, the Smart is a hoot, with nippy gearing and sharp steering. Push further, and it is possible to get the front end to slowly relinquish grip, though there is never enough power available to make it a problem. Thankfully, the Smart will not topple very easily, despite its tall profile. Indeed, it can be driven around corners much quicker than I expected, and other road users are often surprised to see it doing so. 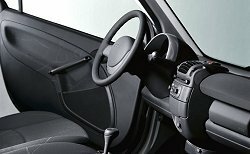 If it all goes wrong you will be glad to know that the Smart is a safe little car, with its 'Tridion' safety cell and airbags in the right places. Saying that, in a fight between the Smart Cabrio and a Range Rover, I think I know where I would like to be sitting. 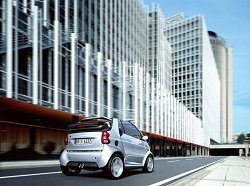 The speed of the Smart is perfectly suited to the vehicle. However, we have taken a star away due to the delay between gearchanges. I love the grumble of this three-pot engine, and the urge provided by the turbo. The negative side is that it is a little too noisy on the motorway. As capable as the Smart is, and fun, the short wheelbase and height conspire to thwart this car's ability. We look forward to trying the new Roadster. The quoted figures below are impressive, though I we did not manage such high figures. The loss of a star though is due to the frequent fill-ups due to the tiny tank. The steering wheel and seats, in leather, are lovely, but the rest of the car is a little plasticky (even if it is of high quality), and the gearchange again ruins it. The Smart design may not be to everyone's tastes, but it is original and still unique. The lost star is for potential unwanted stares, and that awful Numeric Blue pattern. The Smart's interior is a very pleasant place to be, until the wind noise encroaches. Keep to town use and it is a joy. 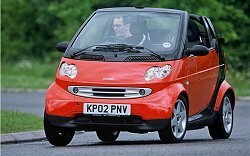 On paper, the Smart is a very safe car, but you can't argue with the simple fact that it is tiny and less likely to win many momentum fights. 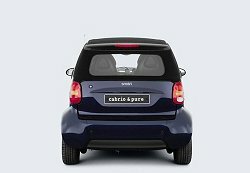 For the price, the Smart Cabrio is incredibly well equipped. 0-62.5 mph (seconds): 16.8 (Softip) / 17.1 (Softouch). Urban mpg: 48.7 (Softip) / 47.1 (Softouch). Extra urban mpg: 68.9 (Softip) / 65.7 (Softouch). Combined mpg: 60.1 (Softip) / 57.7 (Softouch). CO2 (g/km): 113 (Softip) / 118 (Softouch). Three cylinders inline - petrol. Bore x stroke (mm): 63.5 x 63.0. Valve gear: Two valves per cylinder. Max power (bhp): 61 at 5250 rpm. Max torque (lb.ft): 65 at 2250 - 4500 rpm. Sequential 6-speed gearbox with automatic ingle-plate dry disc clutch. Front: MacPherson strut suspension, stabiliser rod. Rear: De Dion axle, coil springs, shock absorbers, stabiliser rod. Steering: Rack and pinion with steering damper. Brakes: ABS system with two circuits and servo assist, front discs, rear drums, electronic braking force distribution (EBD). Wheels: Front: 4x15 / Rear: 5.5x15. Tyres: Front: 145/65 R15 / Rear: 175/55 R15. Cargo volume (litres): 150 - 260. Fuel tank capacity (litres): 38 (including 5 litres reserve).